The morning after five police officers were fatally shot in Dallas, Texas, police officers were ambushed and shot in the St. Louis suburb of Ballwin, Missouri and Valdosta, Georgia. Authorities in Tennessee said Thursday’s shooting also targeted cops. The officer wounded in Missouri was taken by ambulance to the Mercy Hospital emergency room, according to reporter Mike Colombo. He is in critical but stable condition, the Ballwin Police Department said Friday afternoon. The Ballwin police officer was walking back to his squad car when the suspect got out of his car and ambushed the officer with a firearm before fleeing the scene, an unidentified source told KSDK’s Jacob Long. Footage from the dashboard camera shows the officer was shot from behind, Ballwin PD chief told reporters. 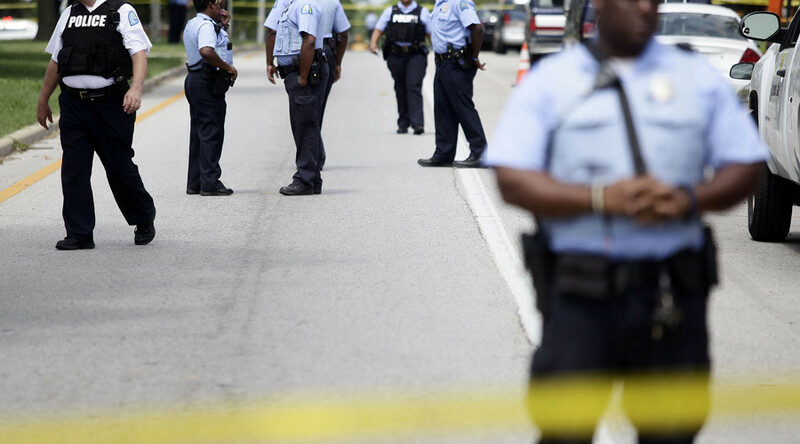 The officer was shot in the neck during a traffic stop, the St. Louis Post-Dispatch’s Christine Byers reported. A weapon was recovered. Police described the suspect as a tall, thin African-American male wearing a gray T-shirt and blue jeans, and driving a blue Ford Taurus with Illinois temporary tags, according to KTVI. The suspect was arrested after a search of known residences associated with him, Long reported. A police incident has occurred in the City of Ballwin; alleged suspect is in custody. 800 block of Burgundy is temporarily closed. The Ballwin officer is at least the second to have been shot in the US on Friday morning. An officer in Valdosta, Georgia was injured in an exchange of gunfire with a suspect. Deeply concerned by reports of an officer shot in Ballwin. This violence must stop. The officer was investigating a report of a damaged vehicle when a man opened fire, which the officer returned, police said. Both men were injured and are expected to survive. The suspect called 911 call to report a break-in, then ambushed and shot the officer, authorities clarified to AP on Friday afternoon. The Valdosta officer was shot “multiple times,” Police Chief Brian Childress said, as quoted by AP. "He is out of surgery now. His family is at the hospital. And I'm happy to report he's going to be fine," Childress said. "He's in stable condition but he's in the ICU as a precaution." One of the gunshots hit the man in the abdomen, just below his bulletproof vest, Georgia Bureau of Investigation spokesman Scott Dutton said. Other bullets hit the officer in his vest. There’s nothing to indicate the Valdosta shooting is related to the one in Dallas, Childress said, though he noted it is still early in the investigation. "You start to wonder. But any motive of why this happened this morning would be speculation," Childress said. In Texas, five police officers were killed and seven other cops and two civilians were injured by a gunman during a peaceful protest Thursday evening. The Valdosta officer was wearing a body camera, and its footage has been turned over the the Georgia Bureau of Investigation, the police chief said. The gunman who shot at cars on a Tennessee highway on Thursday morning was “troubled” by police shootings of African-Americans, and may have been targeting officers, the Tennessee Bureau of Investigation said Friday afternoon. Meanwhile, on Friday morning, police in Orlando, Florida received a “vague threat” that is being thoroughly investigated. The police department, still reeling from the aftermath of a massacre at a gay nightclub in the city that killed 49 people plus the shooter, would not give any details about the threat, citing security concerns.